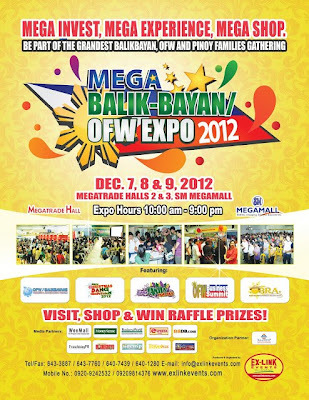 Ex-link Events gives you the 9th MegaBalikbayan OFW Expo on December 7,8 and 9 at SM Megatrade Hall 2 and 3. The business summit was for our OFWs, which aims to help our OFWs to start businesses of their own. 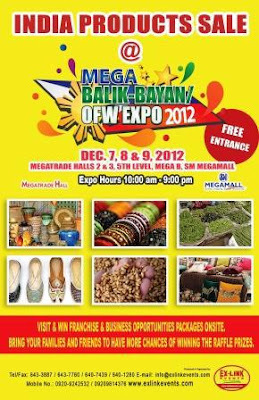 The event is not only for Balikbayans and OFWs but also a business opportunity and seminar for everybody who wanted to invest for a business that their family can manage for the coming year. Don't forget to visit the bazaar, exhibitors promises to give you the best product for a reasonable price in time for Christmas shopping for friends and love ones. For more details please contact 643.3887. Ex-link Events really handles even smoothly and this was another successful event they have handled. I really admire our Filipino OFWs. I have relatives who are really dedicated in their job to help their families in the Philippines. Amazing people. I haven't been to this kind of event. It would be nice if it is scheduled in time for my vacay.